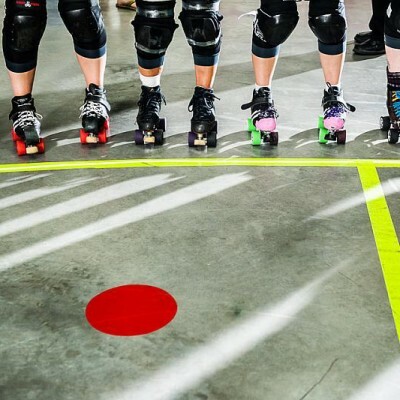 The 2017 WFTDA Division 1 Playoffs season has begun, with teams from all over the world competing for a chance to make it to Championships. During these playoff weekends, have you ever wondered how these athletes prepare? And not just physically prepare, but also mentally prepare for the pressure and stress that can come during a playoff tournament? 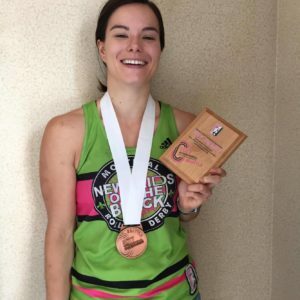 For this special playoff edition of the Mental Muscle, I sat down with Falcon Punch, the Tournament MVP from the WFTDA Division 1 Playoffs in Seattle, to get the inside scoop on how she prepared herself for the big tournament. Let’s take a peek at how this top athlete prepares! Falcon Punch is a jammer for the New Skids on the Block from Montreal, Canada, and for Team Canada. She has competed at two prior playoff tournaments (2015, 2016), and a Championship tournament (2016) all with Montreal. Mental Muscle (MM): Do you have a pregame routine to help prepare you mentally? Falcon Punch: I just try to get a good night of sleep before a game and relax. I feel I perform best when I am calm and I remind myself that I’ve spent hundreds of hours training for this moment. I also remind myself to be happy! Analysis: Falcon Punch’s routine is not in a form of a list of tasks that she needs to accomplish, instead her routine focuses on getting into the zone. Her optimal zone of performance comes when she is well rested, calm, happy, and well prepared. Falcon uses her past experiences of training to help build confidence in upcoming performance. She knows the time and effort she has put into her practices and athletic training. If she trained as hard as she could, she knows that there is no reason she cannot perform at her best ability. MM: Do you implement this routine at practices? Or do you have another approach for practices leading up to playoffs? Falcon: Since it is more a mental preparation, I guess I could say I apply it by being very focused in practice. I always give 100% because when I go into a game that’s what I’m counting on. In practice I try to recognize when and why I get into yellow and red zones during practice (see self-awareness post to understand the zones), but I haven’t quite figured out how to change it back to green. Work in progress! Analysis: Falcon might not use the same routine per se before practices, but she does use her practice to prepare for games. She knows during a game she expects herself to give 100%, therefore in practices she does not hold back. She practices the way she competes. More importantly, she has a great sense of self-awareness and knows when she is not performing at her highest level. Even as a top roller derby athlete she is still working hard to stay in her green zone during practices and competitions. Falcon Punch: A lot of game watching. It helps me visualize and feel like I’ve very already done it. Relaxation and self care: I listen to my body to know when I need to slow down or take a break. Analysis: Falcon uses previous game footage to help establish mental images for visualization. Visualization incorporates not only the sense of sight, but also hearing, smell, touch, and even taste. The more senses that are involved, the more realistic the mental images would become. Realistic images are important because our brains cannot distinguish actual events and images from these events. Therefore the more realistic these images become, the higher the chances that your brain will think that these images are real. The goal of visualization is to make new pathways (links) within your brain. Since your brain cannot tell the difference between the actual event and images about this event, your brain will think that the mental images from your visualization sessions are from the event itself. Basically, your brain will think it has/can accomplish certain tasks and/or skills. Falcon uses visualization and footage review to strengthen technique and to improve confidence. MM: Heading into the D1 Playoffs in Seattle, how were you mentally preparing for that weekend? Is there anything different compared to a game in the regular season? Falcon Punch: A slight increase in team meetings and game review. Other than that: gym and mediation. Analysis: There was not a lot of change with Falcon’s prep heading into a D1 playoff tournament. 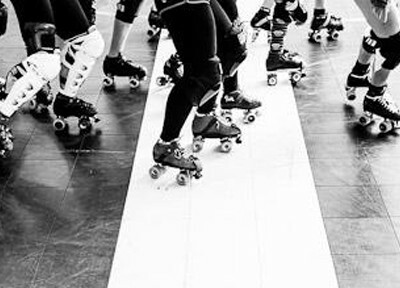 Since roller derby is a team sport, the changes come mostly on a team front such as having meetings or reviewing footage as a group. As an athlete, Falcon is doing her part by staying in top form at the gym and meditating to stay calm. These were two elements that she used to prep for every game. Sometimes as athletes, we think that we need to change our entire routine based on the importance of the game. What is actually important is being consistent. As the old saying goes “if it ain’t broke, don’t fix it”. If you have a routine that is working for you in the regular season, then use it! MM: How do you know if you are mentally ready for a game? Falcon Punch: Honestly I never really know, I haven’t noticed a pattern before games yet. Sometimes I feel ready and I’m not satisfied with how I perform, sometimes I don’t feel ready and I have the best game ever. I am still working on [self-awareness skills]. When it is game time, I focus on what I have to do in that moment. Analysis: Falcon brought up a good point; athletes need to try to come into a game in their optimal zone (or green zone). But as soon as that whistle blows, we need to turn our focus to the game at hand. It does happen that an athlete can come into a game feeling one way, and a change (positive or negative) can happen that could affect their performance. To be able to make adjustments (focus/distraction control, controlling emotions and/or actions) during game play comes with practice and strong mental skills. Even as a top athlete, Falcon is still working fine tuning and improving on her mental game. Just like any type of training for roller derby, strengthening one’s mental game requires work and practice! I hope you enjoyed this special Playoff Edition of Mental Muscle, and thank you to Falcon Punch for sharing! What do you do to prepare mentally for an important bout or tournament? I’d love to hear from you in the comments!